Drove from FL to TN to VA to PA where we have settled into Stu's Coast to Coast home park. Had a few issues getting settled....seems as though the site they assigned to us was a) already taken, b) too small and c) only 30 amp. LOL! After some heavy discussion, they found a spot for us for two weeks. We did buy some ramps to help get Stu's bike loaded without scraping the pipes...especially important after he got the new ones with his stage one upgrade. We went to Stu's 40th high school reunion in Maryland last weekend. Had a blast....fun to meet some of his old friends and hear about their antics. Toss in good food, drinks & great music...what more could you ask for? Met up with our wedding mates, Duane & Kathi, for a nice afternoon and evening of good company, conversation, a few beers and a great dinner. Oh, they helped us with number 6 on the list. Bought a second motorcycle. Yup, that's what Stu gets for putting me in the drivers seat on the trike! After a lot of discussion, sitting on bikes, measurements and searching, we found a great buy on a 2008 Harley-Davidson Nightster with only 562 miles on it. No photos yet other than a view from the ad where it was listed for sale. Heading out to Roanoke, VA tomorrow and won't be back till probably Tuesday. We'll be meeting up with several dozen of my closest women riding friends....what a blast that will be! Stu will get to chat with the other Cabana Boys attending....hee-hee! Stu's girls flew to Florida to visit with Mom-Mom. Before getting to see her she had a fall getting out of bed at night. After seeing her the first time, it happened again. She is now back in the hospital and getting some additional physical therapy. They will visit her there tomorrow before flying back to Maryland. There are a few photos uploaded to SmugMug - including the cute little frog Stu photographed outside our campsite in Bushnell, FL (where we also encountered several deer as we came back after an evening movie), and the pics of the bike loading using the ramps (the trike, not the new bike). Also a few from a Florida bike night, me practicing on the trike and some scenery in TN/VA area. When we get back we have to work on getting the setup done in the trailer for the second bike. We have ordered a Condor self-locking chock for it and will need to install that. In addition we have to locate a spot where we can easily load....the Nightster only has a little over 3" clearance and if the ramp is too steep it won't load without using blocks under the tires...not something I really want to do. So life is good, we are just very busy and needless to say, the blog suffers. Most of our family and much of our friends are on Facebook and they get the quicker (ie; shorter) updates. LOL! Yup, we're still here....just been too busy to blog much (added to the fact that there hasn't been much blog-worthy stuff happening). Doing as much riding as we can, got the 1k service done on the bike and then a Stage One upgrade (high flow air filter, mapping download and new slip-on pipes). MAJOR performance improvement, runs a little cooler and is already getting better gas mileage. We will be in Gettysburg, PA for two weeks starting next Wednesday but already have both weekends booked, including a nice ride down to Roanoke, VA for a great couple of days with a group of motorcycling women riders that I've known for 6-7 years. WHOO-HOO!! Stu will be an official Cabana Boy for a couple of days. Hee-hee! Below are some excerpts of my correspondence to my family on Mom Mom's status update.. I really appreciate all the comments, notes and expressions of encouragement for many of you during this emotional time in our lives. Those that know us, know that Donna and I have been through times like this before and both of us have learned to remain optimistic and upbeat. We both share all the good times about those that have moved on and continue to enjoy our lives together. It is what all our loved ones would want and what we would want for those that follow to do as well. Sad? yes, of course it is. But most of all, we have been privileged to share this world with some of the greatest people ever...'nuff said. No good news today. We finally got what we knew already confirmed. Mommom’s cancer is back after a 25+ year remission. Way back, Mommom had a mastectomy, she has been essentially cancer free since. A lump developed this year and it was biopsied last week. Examining her, it sure looked malignant to Donna and I, but we needed to be sure. The test results indicated a fairly advanced malignancy. Unfortunately, she is not a good candidate for any kind of treatment. Surgery, chemo, or radiation would have a severe impact on her weak heart and well worn body. She is having no pain with the exception of a little tenderness local to the tumor. It is causing some swelling in her left arm and hand that will be treated with elevation. 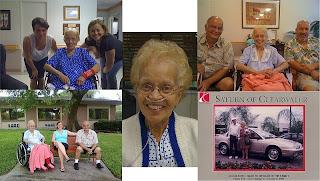 The staff at Coral Oaks are aware of her condition, limitations and Her wishes as expressed in her Living Will. I have every confidence that Mom Mom will be treated well and will remain happy and good spirited. I believe I have done everything that I can do for right now. I certainly don’t need to hear a bunch of whining and boohooing over all this. Mom Mom has had and continues to have a great life. She lives her life on her terms. She still speaks very fondly of Pop Pop and will tell you about all of their travels and how much she enjoyed it all. So buck up McNicol clan and continue to celebrate the life of your eldest member….she ain’t done yet. Once again, thank you to everyone who has commented, "shouted-out", Facebook updated & emailed us. We greatly appreciate your love and support.